This article is about the Wii U game. 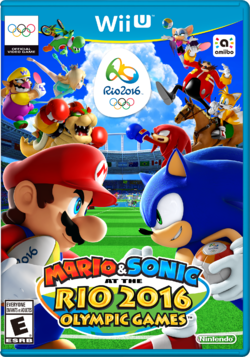 For the 3DS game of the same title, see Mario & Sonic at the Rio 2016 Olympic Games (Nintendo 3DS). For the arcade game of the same title, see Mario & Sonic at the Rio 2016 Olympic Games Arcade Edition. Mario & Sonic at the Rio 2016 Olympic Games is a sports title for the Wii U, which is the fifth installment on the Mario & Sonic series, along with the Nintendo 3DS version. Like the other games, it takes place in the host city of the Olympics of the corresponding year, being Rio de Janeiro. This monitor is activated after passing the first phase of the second tournament. Here, messages from other players sent to the game's group on Miiverse can be seen, furthermore the player can talk to Red Toad to send a message to the game's group on Miiverse. This pedestal appears once the statue of the Versus Arena is completed. Here a Shy Guy can be talked to in order to participate in match against the ghosts of other players in three events; the 100m Dash, the 4x100m Relay, and the 100m Freestyle. The player can choose to challenge a ghost of a player with similar skills as them or the best ghost recorded for the event. Here Big the Cat can be talked to in order to view the current collected items, change the player's Mii's outfits, change the background music of events, view the player's profile, change various settings or view the game's credits once all level 3 tournaments are cleared. A Lakitu on his Cloud appears on the beach every five Gold Medals or 1st Place Medals earned. By talking to him the player receives 30 Coins and 30 Rings as a reward. If the player's Mii is wearing the full Lakitu costume, Lakitu will double the prize to 60 Coins and 60 Rings. After winning all level 1 tournaments, Rio carnival floats can arrive at Copacabana Beach once a tournament ends. After the first time, the carnival floats return after 3 tournaments not chosen using the "Past Tournaments" option. When this happens, the background music of Copacabana Beach is replaced with a vocal theme song, Canção do Rio, and five Miis at the beach give information about Brazil while the others talk about the ongoing carnival. There are four types of float, each one with a character (selected at random from a pool of specific characters for each float) that can be challenged to a Carnival Challenge in order to obtain a part of his or her costume. If the costume part has already been obtained, a wear that has not already been obtained will be given to the player, either a hat or outfit or a costume part that can be obtained at the item stand of the team the challenged character belongs to. When every wear has been obtained, the prize will be either 99 Coins or 99 Rings, depending on the team of the challenged character. The carnival challenge consists in winning in a match against the character while satisfying peculiar conditions. The image shown on the card illustrating the conditions indicate the kind of item obtained when winning. Only Miis can participate in Carnival Challenges. In order to participate in said challenge, the player must pay either Rings (for Sonic's and Dr. Eggman's floats) or Coins (for Mario's and Bowser's floats). If the player fails to win the challenge, the challenge can be retried by paying an increased amount of Rings or Coins. After three unsuccessful tries, the character on the float becomes easier to beat. The Rio Carnival stays at Copacabana Beach until the player participates in a tournament. There are four floats: Mario's, Bowser's, Sonic's, and Dr. Eggman's. 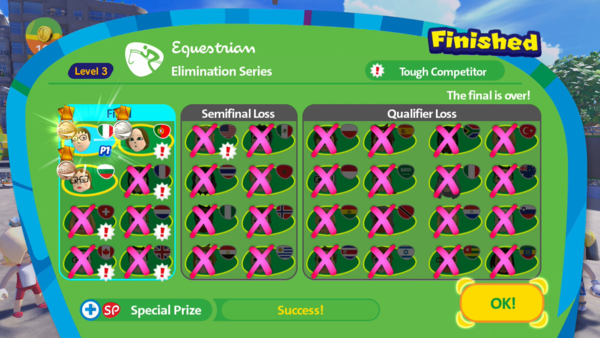 Three participants in a level 3 Equestrian tournament: Larry Koopa, who is controlled by the player, Sonic the Hedgehog and a Mii. When the player is participating in a tournament, a few changes happen at the beach. The background music is changed, all the characters participating in said tournament can be found at the beach and the player's Mii is replaced by the Mii or character chosen in the character select screen shown when entering said tournament. Furthermore, there are also Miis that give suggestions about hidden controls or features of the tournament's event; among those, one Mii gives a tip in the form of a card that can be collected and is shown after each match in said event, if all said tip cards for that event haven't been collected. Lastly, the player is not able to participate in ghost matches, single events or in the Heroes Showdown and is not able to change the number of players in the ongoing tournaments. The yellow background indicates that the information is shown while talking to the player's Mii. 35 characters are playable. Character costumes that can be used by Miis are playable as well. The 21 characters that are playable in the Wii versions of the second installment and third installment, as well as the fourth installment, are playable in all events. All newcomers to this installment (known as guests) are only playable in one event each (with the exceptions of Diddy Kong, Jet, and Rouge, who are also playable in the Duel versions of their respective events). Like the 3DS version of the game, guests have to be unlocked by winning a match against them. Unlike the other home console versions of Mario & Sonic games, there are no character types. However, each character still has three stats (Power, Speed and Technique) that are then translated in stats specific for each event. The points for each stat range from 0 to 10, with base stats for the characters in Team Mario and Team Sonic ranging from 3 to 9 and having a sum of the points of the three stats which is always 18. Mii without hats and outfits has 2 points in all stats. This cheerful hero is known for his red cap and mustache. He's incredibly athletic, and excels at nearly any sport he tries. He and his brother Luigi are currently competing to see who can win the most Olympic medals. This green-capped Mario brother is easily scared, but a kind person at heart. Although he often finds himself overshadowed by his older brother, he's actually quite skillful himself. He's come to Rio with the goal of winning more Olympic medals than Mario, who always seems to hog all the attention. The princess of the Mushroom Kingdom. She's come to the Olympic Games with a bevy of Toads by her side, and is driven to put on a brilliant performance in the name of all the Toads back home who couldn't attend. This voracious friend of the Mario brothers hails from Yoshi's Island. He uses his long tongue to eat just about anything, but is especially fond of melons and other fruits. He's attending these Olympic Games with a host of colorful friends at his side. The peppy princess from Sarasaland is having a blast at the Olympic Games! In her downtime, she plans to chow down at fine restaurants and maybe get a little shopping in with Peach. Money, money, money! This scoundrel has taken on all sorts of jobs in his pursuit for cash, including treasure hunter, adventurer, and even president of a game company. His latest scheme involved dominating the Olympic Games with the power of garlic, thus allowing him to hog all the valuable gold medals for himself. This oddball sports a hat with an upside-down L on the front. Although his distinctively scrawny physique leaves him without much power, he makes up for it with flexibility and athleticism. Despite his seemingly lackadaisical attitude, he actually trains quite hard behind the scenes. The vicious and egotistical King of the Koopas! He's come to these Olympic Games with a host of seasoned minions in tow, and ordered them to win gold on penalty of fire breath - even though he plans to keep all of them for himself. It's just what any good villain would do. Bowser's prankster of a son. Since Dad spoiled him rotten, he now expects to get his way. Despite his selfishness, he still holds Father in high regard, and wants nothing more than to impress him. Although this mild-mannered king of the jungle isn't the brightest banana in the bunch, he boasts exceptional strength with which he hopes to dominate the Olympic Games. Since DK and his friends normally live in the jungle, these Olympic Games are perfect for his training regimen. Compared to the 3DS version, Dry Bones, Ludwig, and Roy have been cut. However, Toad makes an appearance as the sole playable character exclusive to the Wii U version. Birdo has also been cut, but makes an appearance as a non-playable character at the sand statue at which the Heroes Showdown modes can be chosen. Although this simian lacks the brute strength of his buddy Donkey Kong, he makes up for it with keen agility and technique. This skill set makes him particularly well-suited for dodging tackles in rugby sevens. This mysterious creature carries a large sack over its shoulder, and also conducts research about Mario from a base on Secret Island. He's surprisingly fast despite the hefty sack, and hopes to use that speed to full effect in the Olympic Games. This lone girl among the seven Koopalings has a bullish attitude and always seems angry. She's also very style-conscious - wearing a necklace, bracelets and high heels. Because of her personality, her only focus now is on winning the Olympic Games. One of Bowser's seven Koopaling henchmen. His unique ruffled mohawk and blue head star give him a flashy appearance. In the Olympic Games, he performs acrobatic movements on horseback to thrill the crowd! A mysterious woman who travels aboard the Comet Observatory starship. She's taller than Peach and Daisy, and has an air of mystique about her. Having seen past Olympic Games from her observatory, she's finally decided to come enjoy the fun in person. One of the many Mushroom Kingdom Toads who serve Peach. Many of his fellow Toads are involved with running the Olympic Games, while others are participating in the actual events. Bowser's skeletal form. This bony transformation grants him the agility of lightweight competitors while maintaining his heavyweight power. Only those who've boned up on their skill set can hope to pull off such a humerus technique. A blue hedgehog with a penchant for high speed, Sonic is a free spirit with a love for adventure. He despises anything that is unfair and will get into trouble to help anyone in need. For Sonic, saving the world is just another thrilling episode in his life. He's currently hoping to turn his innate speed into some quick gold. Sonic's best friend and trusty sidekick, Tails can use his two tails to fly, allowing him to lend Sonic a helping hand with hard-to-reach places. Tails is also somewhat of a technical genius, applying his mechanical expertise to invent all sorts of vehicles and other robotic contraptions. Undaunted by Sonic's speed, he's determined to use his wits to propel himself to a gold medal. An over-enthusiastic, but good-natured hedgehog girl with a preference for cute things, sweets, and shopping. Amy's constantly trying to close the gap between her and Sonic, but the Blue Blur is one tough guy to catch. She hopes to spend the Olympic Games enjoying the sights of Rio, and is looking to bring home a gold medal as a souvenir. A red echidna that boasts some serious muscle, Knuckles is what one might call "best frenemies" with Sonic. He's a capable treasure hunter, but his straightforward and trusting nature gets him mixed up with less-scrupulous characters on occasion. He's eager to test his formidable agility and prodigious strength to the fullest in the Olympic Games. A noble princess from another dimension who is also guardian of the Sol Emeralds. Blaze has a kind heart, and always stands up for those who can't stand up for themselves. In addition to being athletic, she also has the power to control flames. After a bit of time away, she's once more crossed over from her dimension in order to rekindle old friendships and test her skills in the Olympic Games. A black-and-red hedgehog who bears a striking resemblance to Sonic. While Shadow may seem like Sonic's rival, he personally hates for the two of them to be seen together. A stoic perfectionist, Shadow has a great deal of pride in his own exceptional abilities. He hopes the Olympic Games will provide him the ultimate competition - one he has no intention of losing. This silver hedgehog from the future has a complicated past with Sonic, but has been known to go on world-saving adventures with him. Silver can use his telekinetic powers to move objects or even levitate himself. He has a rather straightforward mindset, loves world peace and blue skies. The true and fair spirit of competition cultivated by the Olympic Games is what drew Silver back from the future. This evil scientific genius needs no introduction. Dr. Eggman is constantly plotting to fulfill his hopes and ambitions of conquering the world and rebuilding it into his ideal "Eggmanland", but Sonic always manages to stop him. His current madcap scheme is to sweep the medal race, then hijack the competition and turn the Olympic Games into his own Eggman-sponsored affair. This high-performance combat robot was built by Dr. Eggman for the sole purpose of defeating Sonic the Hedgehog. Metal Sonic's metallic frame resembles Sonic, as does his speed, power, and endurance. Like Sonic, Metal Sonic plans to put his exceptional speed to the test at the Olympic Games. Compared to the 3DS version, Omega and Eggman Nega have been cut. Cream the Rabbit has also been cut as a playable character, but appears in non-playable capacity much like Birdo, as keeper of the Sonic Edition of the Item Stand. Jet is the leader of the Babylon Rogues, and Sonic's rival when it comes to "Extreme Gear" racing. His mastery of the board is so impressive, he's earned himself the name of "Legendary Wind Master". When he's not seeking treasure, he's looking for new speed challenges. The pace and technical skill required in ball sports caught his eye, and he intends to add a few Olympic medals to his collection. A sultry bat with an air of mystery who specializes in jewels, Rouge is a brave and seasoned spy who boasts excellent footwork in a fight. Although a treasure hunter by nature, her love for gems can sometimes cause her thieving tendencies to take over. Perhaps she entered the competition in order to get her hands on a shiny and sate her lust for glitter. A member of the Babylon Rogues, Wave serves as the team's mechanic as well as strategist. She can't abide anyone she considers less intelligent than herself - which in her mind is pretty much everyone else. Nevertheless, she still admires Jet and serves as his faithful follower. She seems especially fond of Olympic events that involve riding on things. This straight-laced detective is the voice of reason in the Chaotix Detective Agency, but his reserved demeanor hides a burning sense of justice and a refusal to let evil have its way. Trained as a ninja, this chameleon is a master of throwing kunai, and can vanish using his Leaf Swirl technique. For Espio, these Olympic Games are merely a step along the path to perfecting his art. Zavok is the strongest of the sinister Zeti and the leader of the Deadly Six. As the last disciple of Master Zik, he's a certified force to be reckoned with. Along with his formidable physical prowess, a calm demeanor and penchant for quick-thinking makes him well-suited to leadership. His greatest joy is in improving his skills, which makes the straight-forward competitive nature of the Olympic Games quite appealing. A free-spirited badger who lives on the outskirts of the jungle. Sticks is a bit wild due to her woodland upbringing, but she's a talented hunter who can take down any prey with her trusty boomerang. She's also obsessed with things that glitter, and so has come to Rio after hearing she might be able to win a shiny medal. The wild and crazy member of Dr. Eggman's Deadly Six, Zazz is every bit the metalhead he looks like and and his unruly and unpredictable personality makes him destructive even by Deadly Six standards. He hates boredom above all else, and will fly into a rage when held back from a fight. His competitive style is a bit more chaotic than is usually seen in the Olympic Games. Fourteen official Olympic Games Events and three Duel Events are playable along normal events. In the Duel Events, special items from the Mario and Sonic universes are usable and certain actions increase Duel Points. Once a try, point, or goal is scored, said Duel Points are added to the total score of the team while the Duel Points of the opponent's team are halved. In tournaments of Duel Events, 1st Place, 2nd Place and 3rd Place Medals are earned instead of Gold, Silver and Bronze Medals respectively. Also referred to as the Sambódromo, after the neighboring arena. Said to be the birthplace of samba, it also hosts Rio's world famous Carnival every year. Located on Rio's famous Copacabana Beach, this moon-shaped seaside locale is one of the most recognizable locations of these Olympic Games. The "X-Park" within Deodoro Olympic Park, this 400-meter long BMX course will remain in use once the Olympic Games are over. This famous public square in Rio is bordered by modern high-rise buildings, as well as the Brazilian National Library, an opera house, and other historical edifices. Located in Deodoro Olympic Park-- in the neighborhood of the same name-- this 20,000-seat stadium will host the first Olympic Rugby Sevens match. A 78,000-seat stadium famous for football. Built in the 1950s, it underwent major remodeling in 2014. The Opening and Closing Ceremonies will be held here. Located in the center of Barra Olympic Park and close to the Olympic Village. It seats 18,000, and is used for aquatic events such as swimming and water polo. Located in Deodoro Olympic Park-- in the neighborhood of the same name-- this facility was built for a 2007 sporting event and was expanded for the Olympic Games. A track-and-field stadium used for major Brazilian events. It normally seats 45,000, but has expanded to fit 60,000 for the Olympic Games. A multi-purpose sports facility built in 2007, Rio Olympic Arena is the city's largest indoor stadium. It's used for sports, concerts, and cultural events. Rio's main exhibition space, this convention center is over 25,000 square meters large and can seat 5,000. It's less than a five-minute walk from Rio Olympic Park. A temporary indoor space built for the Rio 2016 Olympic Games. At 14,000 square meters in size and seating over 6,500, it will mainly be used for Boxing events. Set in the heart of Rio, this scenic lagoon is surrounded by famous landmarks, including Copacabana Beach. The vast lake surface makes it an ideal sailing spot. Famed as the traditional venue of the Carnival Parade, this stadium is also used for sports and concerts. It was recently renovated to fit over 72,500 spectators. 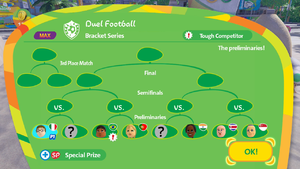 Tornaments, unlocked after winning in five Single Matches, are event-specific and consist in three phases. Furthermore, a special prize is earned if a condition related to each tournament is satisfied. Four levels of increasing difficulty exist. After a few unsuccessful attempts at obtaining a medal, the difficulty of a specific tournament decreases, even though its level remains unchanged. 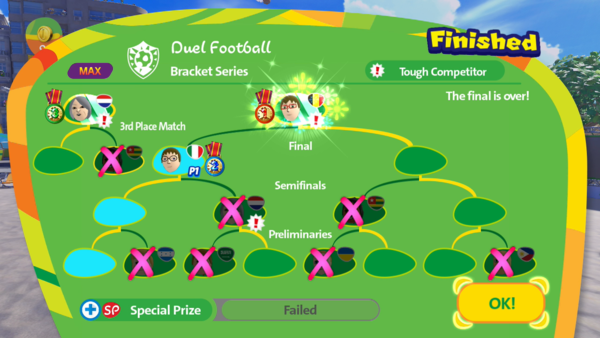 The participants in a level MAX Duel Football tournament before the character select screen (left) and after the preliminaries (right). Since Bowser Jr. was chosen as leader for the player's team, the unknown team leaders were chosen among characters of Team Sonic. The participants of tournaments are mainly Miis of other players and the character or Mii chosen by the player. Characters from Team Sonic and Team Mario can sometime participate in tournaments of level 2 or higher. After the first time, said characters appear every 3 tournaments played. When this happens, their presence is indicated by a question mark in place of the head of the athletes participating in the tournament. Said characters are actually decided after the player chooses and confirms the character or the first character in a team in the character selection screen. If a character from Team Mario is chosen, all those characters will come from Team Sonic, if a character from Team Sonic is chosen, all those characters will come from Team Mario, if a Mii is chosen, those characters will be selected among all characters from both teams. It is important to note that in events involving teams these restriction apply only to team leaders, that are the characters whose heads replace the question marks and who are actually found in Copacabana Beach, the other members of their teams are chosen among the remaining characters in both Team Sonic and Team Mario. In each tournament, tough competitors are indicated with an exclamation mark. 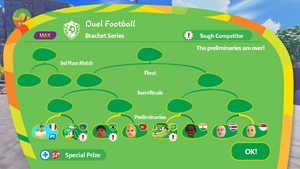 Finally, guests of the particular event of the tournament may appear at Copacabana Beach after the qualifiers or preliminaries are passed, if the player talks to them their flag is earned, furthermore if the tournament is successfully cleared, the guest challenges the player and, if beaten, is unlocked. After all level 3 tournaments are cleared, it is possible to choose characters from Team Mario and Team Sonic in the character select screen shown while entering in a tournament. There are two kinds of tournaments: elimination series and bracket series. The structure of a level 3 Equestrian Tournament, an elimination series tournament. This kind of tournaments is composed of four Qualifiers, two Semifinals and one Final. In each phase (Qualifiers, Semifinals and Final) the individual performances of athletes are evaluated and ranked. In the Qualifiers and Semifinals the first half of the athletes passes to the next phase, while the bottom half is eliminated. In the Final, the first three athletes receive the medals. The structure of a level MAX Duel Football Tournament, a bracket series tournament. This kind of tournaments is composed of four Preliminaries, two Semifinals, one Final and one 3rd Place Match. In each phase (Preliminaries, Semifinals, Final, 3rd Place Match) an athlete or their team directly faces another athlete or their team. In the Preliminaries the loser is eliminated while the winner advances to the next phase; in the Semifinals the winner advances to the Final while the loser advances to the 3rd Place Match; in the Final the winner wins a Gold Medal or a 1st Place Medal, while the loser wins a Silver Medal or a 2nd Place Medal; in the 3rd Place Match the winner wins a Bronze Medal or a 3rd Place Medal, while the loser is eliminated. During a tournament, it is possible to either leave it completely or suspend it. In both cases, Copacabana Beach will return to the normal state and, as a consequence, the player will take control of their Mii and Ghost Matches, Single Events and the Heroes Showdown mode will be available again. In the second case, the player will be unable to change the number of players participating in a tournament but will be able to resume the tournament, with any subsequent failure in the resumed phase of said tournament resulting in immediate elimination, even in bracket series tournaments. During tournaments, prizes are earned for certain achievements. The victory pose of Bowser and Bowser Jr.. It is important to note that medals are only earned when arriving in the first three places in a tournament, as such, the victory animations can only be seen after obtaining a medal in a tournament. Both animations for single characters as well as animations for specific pairs of characters are featured. The animations that only involve the playable characters of Mario & Sonic at the Olympic Winter Games are the same ones featured in Mario & Sonic at the Sochi 2014 Olympic Winter Games. The prize depends on the character selected in the character select screen at the beginning of the tournament. If a character from Team Mario is selected, the prize is in Coins, if a character from Team Sonic is selected, the prize is in Rings, if a Mii is selected, the prize is equally split into Coins and Rings using half up rounding. The special prize increases the prize of the medal by half using half up rounding. In addition to these prizes, a wear is obtained when obtaining a medal in the tournament for the first time. Leagues are special tournaments that can be accessed after winning 25 tournaments using either an amiibo related to the Mario universe or a Sonic amiibo. The Mario League, accessed with a Mario-related amiibo, has the player's Miis playing against opponents from Team Mario, while the Sonic League, accessed with the Sonic amiibo, has the player's Miis facing characters from Team Sonic. The reward of the Leagues is either a Mario or a Sonic Mii costume. Unlike in the normal tournaments, once a tournament for one sport is done, the player can then do the next tournament for that same sport, instead of having to pass all the tournaments for that level. A Heroes Showdown mode is featured as well. It is unlocked after getting the gold medal in all the Single Matches or after getting more than seven medals in the tournaments. In it the player joins either Team Mario or Team Sonic and participates in knockout rounds against members of the other team in events chosen randomly, until either all members of one team or one of the two captains; Mario and Sonic, are knocked out. The game supports amiibo functionality, accessed from the Shortcut Menu after winning a medal in 25 tournaments rather than by talking to a character in Copacabana Beach. A Mario-related amiibo lets the player enter the Mario League, and the Sonic amiibo lets the player enter the Sonic League. All other amiibo will give either coins or rings. Amiibo can not be used during a tournament or while the Carnival is at Copacabana Beach. This article is under construction. Therefore, please excuse its informal appearance while it's being worked on. We hope to have it completed when a player plays through the game to know more about collectables for this game. Hats and outfits selection at the Pousada. The stats are represented with their actual names. There are 406 collectable hats and outfits for the player to use for their Mii character. Some hats and outfits combinations are able to generate costumes, whose stats are greater than the sum of the stats of the individual parts. A majority of the character costumes return from the previous installments, in addition to some brand new ones. As in the previous installments, music can be collected. All guests' themes are unlocked after beating them in an event. Winning Heroes Showdown with Team Mario unlocks a music track from the Mario series, while winning with Team Sonic unlocks a music track from the Sonic series. Music can also be obtained from item stands. Athletic Theme from New Super Mario Bros. Underwater Theme from Super Mario Bros. Underwater Theme from New Super Mario Bros.
Overworld Theme from Super Mario Bros. Circuit Theme from Mario Kart: Double Dash!! As in other Wii U titles like Super Mario 3D World and Mario Kart 8, players can obtain stamps to use in Miiverse posts. There are a total of 100 stamps in the game. Stamps are obtained at the item stands except for two obtained after clearing all level 3 tournaments. Instead of a simple menu, there is now a fully controllable hub world. In-game tips for each event as well as Heroes Showdown now need to be unlocked by talking to different Mii characters on Copacabana Beach. In addition, tips can now be viewed manually from the Pousada. Victory/losing animations and the Award Ceremony no longer play after completing single match mode, with them now being exclusive to tournament mode. As such, several characters, especially Guests such as Toad, can not be seen with every animation in the game. As with the 3DS version, Sonic now has text-based dialogue as opposed to being mute like Mario, Luigi, and Metal Sonic. Despite being present in the arcade version, the four different character types (All-Around, Speed, Power, and Technique/Skill) are no longer present in the Wii U or 3DS versions. However, each character still maintains their appropriate stats. This game has both a male and female announcer, as opposed to only a male one. Motion controls are not featured in this game to any extent. A free demo of the game was released on the 21st of July in Europe and on the 3rd of August in Japan. It doesn't feature Copacabana Beach and only allows Single Matches to be played. Drew Hurley, Cubed3 7/10 "For parties and families, this is a title definitely worth picking up and it does a great job in encouraging solo play, too. There's little new here, though, with most of the gameplay feeling old hat. Overall, Mario & Sonic at the Rio 2016 Olympic Games on Nintendo's Wii U is a decent addition to the series but lacking anything special to elevate it to that next level." Daan Koopman, Nintendo World Report 7/10 "At the end of the day, I enjoyed what Mario & Sonic at the Rio 2016 Olympic Games on Wii U tried to deliver. While the limited amount of events are the major downer here, I had fun playing them alone or with my friends. They found unique ways to represent the events, which is what matters at the end of the day. I do expect that the majority will be disappointed with the lack of specific Mario and Sonic touches, which is totally justified. From all the games in the series, this one shows the roots of the characters the least. Depending on how far your love for these franchises go, it will impact your purchasing decision more than likely. Boom Boom appearing among the playable characters of Team Mario in the introduction. The game originally featured Boom Boom among the playable characters of Team Mario in the introductory video of the game shown in the Nintendo Direct of March 2016. This video was also reused as the introduction of the game. Despite this, in the final game Dry Bowser, who doesn't appear in the introduction among the playable characters of Team Mario and is only referred to through his flags, replaces Boom Boom and the only playable Boom Booms are the supporting characters of the Rugby Sevens events. Birdo as a goalie in the introduction. Additionally, Birdo is shown as a goalie in the Duel Football event. In the final game, Birdo is replaced by different colored Birdos as goalies while Birdo makes no appearance in the game aside from appearing at the Heroes Showdown sand statue. This is the first home console Mario & Sonic game to be released on the same year of the Olympics in real life, being released six weeks before the Opening Ceremony. This is the first home console Mario & Sonic game where all of the events take place in real life locations. This is the first Mario & Sonic game with its own vocal theme song, Canção do Rio, played at Copacabana Beach during the carnival. ↑ 1.0 1.1 BeardBear (June 22, 2016). Mario and Sonic at the Rio 2016 Olympic Games Wii U Walkthrough Part 6 | All Events Gameplay. Youtube. Retrieved June 23, 2016. ↑ NintenU (June 4, 2016). Mario and Sonic at the Rio 2016 Olympic Games (Wii U) - All Characters Victory Animation. YouTube. Retrieved September 12, 2016. ↑ NintenU (June 8, 2016). Mario and Sonic at the Rio 2016 Olympic Games - All Characters Victory Animation (2nd/3rd Place). YouTube. Retrieved September 12, 2016. ↑ Zephiel810 (July 5, 2016). Mario and Sonic at the Rio 2016 Olympic Games (Wii U) - All Special Animations. YouTube. Retrieved September 12, 2016. ↑ Nintendo UK (March 3, 2016). Mario & Sonic at the Rio 2016 Olympic Games - Opening Movie (Wii U) Youtube. Retrieved March 4, 2016. This page was last edited on April 15, 2019, at 07:19.